Ahead of the 2018 Grand Prix of Qatar, it was time for the first Press Conference of the year – as well as all those ‘back-to-school’ activities that signal the start of another incredible season. 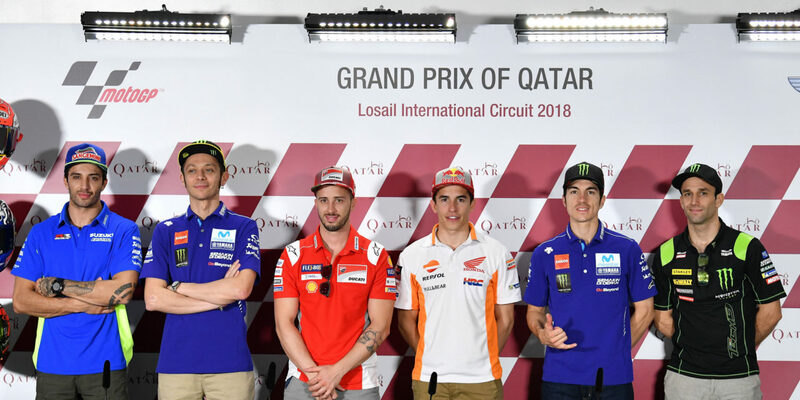 At Losail, that was briefings and photoshoots, with the grid gathering on the start-finish straight for the 2018 class photo. Then it was Press Conference time as the riders faced the media for the first time in 2018, with reigning Champion Marc Marquez (Repsol Honda Team) joined by 2017 runner up Andrea Dovizioso (Ducati Team), recently re-signed Valentino Rossi (Movistar Yamaha MotoGP), teammate Maverick Viñales, Monster Yamaha Tech 3’s Johann Zarco and Team Suzuki Ecstar’s Andrea Iannone. Talk centered on the new season, debriefing testing and contract renewals – with Marquez signed up for another two seasons at Honda last week, and Rossi announcing during Thursday afternoon that he will race on to the end of 2020; making it an incredible 25 years overall. Back on testing and focusing on the race weekend ahead, morale was high ahead of the season opener and everyone is eager to get going, including the man now beginning the fight for his seventh crown. “I’m happy to be here to start the season after a long winter, I think everyone is ready to start,” smiles Marquez. “We started more or less in the best way, with my future already decided. We agreed, I was happy with them and I was waiting a bit to see how preseason started but then I felt happy, and I feel important inside Honda. That’s important. So I’m happy and really grateful to them. It will help a bit this season because everything is sorted. One of the more difficult could prove Losail – and it may be well ‘DesmoDovi’ holding the advantage as competition starts in the desert, with the Italian already having taken some impressive podiums at the venue. So Qatar may not reveal everyone’s hand – but one ace Dovizioso is sure he’s holding is the ability to fight at the front once again. The winner last year, meanwhile, was Maverick Viñales – and the Movistar Yamaha rider hasn’t had the same run in preseason this season, but his confidence remains high. The next man to talk – undoubtedly the talk of the day following his new two-year deal – was Rossi. Talking through the process and his thoughts, the ‘Doctor’ also added some big positives after preseason – saying he feels fast. “I’m happy,” smiles Rossi. “Two years ago when I signed the this contract, I thought maybe it would be the last. I thought I would decide during these two seasons but in my mind it was always very clear, and I want to try and continue. The challenge is very high, to stay at the top it’s always difficult but I think I have enough strength and motivation to try! Fast was a word apt for Johann Zarco, too. The 2017 Rookie of the Year and top Independent Team rider topped the test at Losail, and the first question was a big one. Did he think people would be mentioning his name as a contender for the crown? Andrew Iannone was another of those who fought at the front last season in Qatar, and sadly also crashed out. But that pace is a constant for the ‘Maniac’ at Losail, and this preseason has seen some big improvements. ““The first part if 2017 was very difficult but at the end we recovered the gap and we were closer to the top,” says Iannone. “We continued to work very hard for the future and for the test. I think this year we’re starting in better conditions and from the beginning the bike has been a better base. During the tests the bike has been strong. I think specially here, the feeling with the bike is really good for me, but in any case, everybody is very close but we’ll try our best.” On Qatar as a superfast venue for him, the Italian says he’s not sure – but the number 29 is expected to be a big player on Sunday. So many contenders for the crown, the first 25 points and glory in the desert make mouthwatering reading ahead of the season opener. And after such a long countdown, it’s finally here – the #QatarGP begins on Sunday at 19:00 local time (GMT +3).